Larθi Ceisi, Ceises Velus Velisnal Ravnθus seχ. The first sentence uncontroversially reads "Larthi Ceisie, the daughter of Vel Ceisie (and) Ravnthu Velisna." The second sentence however is sometimes interpreted to mean either that Larthi was married to a person named Uple for a number of years or that she was a prepubescent child with a declined noun or name uples whose meaning is up to future debate. Upon returning to this topic after a long pause, I realized that any added material archaeological evidence that I might have missed which would substantiate Larthi's purported marriage is underlyingly irrelevant to whether the inscription itself is truly mentioning a marriage. Why? Because there are solid and yet simple grammatical reasons that can conclusively mitigate against the supposed marriage of this girl. If we use the standard model of Etruscan grammar and specifically accept that A) -ce is indeed a past perfective suffix and that B) genitive-declined temporal phrases convey punctuality, then both the time reference avils śas and the verb amce are in complete agreement with each other that the event being expressed here is a punctual (ie. non-continuous) one. Ergo, since the state of being married to someone is clearly continuous, not punctual, we simply CANNOT interpret the resultant name Uple as her husband. Rather, if the last sentence were truly talking about a duration of a marriage, the sentence would have used the imperfect past form ame (nb. TLE 924: Hastia Cainei Clantiś puia ame. ), and an accusative temporal phrase avil śa (nb. Pyrgi Tablets: nac ci avil = 'during (the) three years'). The last sentence in the inscription is thus, without a shade of doubt, pointing to the sudden death (nb. a punctual event) of a young girl. It then must be read along the lines of "At six years, she was (given) to Upil." strongly implying that the term Upil, declined in the directive case, is indeed referencing Hades, the land of the dead. (This is not however to deny that there isn't also a similar sounding gentilicium Upaliie of Italic origin (Oscan Upfals) attested in some Etruscan inscriptions.) Locative-declined Ufli as attested in the Liber Linteus could be included as evidence in support of this epithet for Hades, as I suggested before. Read Paleoglot: Me fighting myself on the Etruscan name Uple and Paleoglot: Revisiting TLE 193 and 'The City of Dirt'. Pallottino, The Etruscans (1975), p.216: "Others, on the other hand, have suffixes that determine the verbal character of the form and specify its function, as in the case of the 'perfects' in -ce: tur-ce, 'has given', lupu-ce, 'has died' (cf. its equivalent lupu) or muluvani-ce, 'has dedicated'." Bonfante/Bonfante, The Etruscan Language (2002), p.85: "The word avil, 'year', which occurs very frequently (over a hundred times), in funerary inscriptions, is found with the simple stem (avil) when it is used with the verbs svalce or svalthas, meaning 'to live'. With lupu, 'dead', we have instead avils. This shows that avil indicates a continuous action, 'he lived for so many years ...', while avils expresses a precise action or occurrence, 'he died in such-and-such a year'[...]" This is in effect recognizing that temporal phrases in the accusative case (unmarked in nouns) specify a duration of time while temporal phrases declined in the genitive case point to a single point in time. One form being durative, the other punctual. I suspect other people are having the same trouble with Blogger. I've been noticing an aggravating bug that's just appeared on all Blogger comment boxes that successfully mangles your comments by deleting spaces from them in unpredictable ways for no clear reason other than to elevate your blood pressure. This is really annoying, particularly when you have to rewrite the message over and over trying desperately to make it look moderately readable for others! I'm thinking that it has something to do with a faulty program by the Blogger team that misinterprets things like hyperlinks and thus strips away spaces incorrectly and at inappropriate times if the message is written just so. For me, hyperlinks were the problem and I had to incorporate the links into full sentences with periods before the cursed program left my spaces where they were. WAKE UP, BLOGGER TEAM! HIRE REAL WEBPROGRAMMERS! Ugh! :o) Now I've vented. Carry on, people, carry on. I've been contemplating the inscription TLE 131 lately. I'm pretty sure I know what it says in entirety but I just need to find better historical substantiation for the rites that seem to be described within it before I can be entirely confident of my translation. One particular word, slicaχem, at the end of line 4 can be a headache for us decrypters because it's an unnerving hapax (ie. a word attested only once in all known texts of a language). Nonetheless, it's not all hopeless. We can at least start to comprehend this term by breaking it down grammatically to see what we get. First of all, -m is a very common phrasal conjunctive that normally marks the first element of a sentence, and usually a verb. The left-hand remainder, slicaχe, is indeed a valid verb form and shows the passive preterite suffix -aχ-e (TLE 282: menaχe "(it) was left"). Ultimately then, we're left with the verb root slic- whose meaning must be understood from the surrounding textual and archaeological context, together with the above observations on grammatical patterns. Failing to account for any of these three considerations leads to the typically shoddy, unusable translations we sadly still read in Etruscan literature up to this very year. From the surrounding context of the word (ie. Slicaχe-m aprinθvale luθcva Caθas paχana-c...), I had already gathered that the word must mean something like "approach with" or "bring". However, recently I became curious of the etymology of the word, particularly because of the onset sl- which seems unlikely to come from either a Latin or Greek loan. So then I started reflecting on what the root might have looked like if its origin were dated to before the Pre-Etruscan Syncope (ie. the hypothetical "first" syncope which was probably dated to the end of the 2nd millenium BCE and which produced word-initial consonant clusters in at least Etruscan, Lemnian and Rhaetic). This event is not to be confused with later historically attested Etruscan Syncope of 500 BCE. It stands to reason that if this root dates to this early time, the original protoform should be *salík-. At this earlier stage of the language, word-initial clusters would yet to arise, and any that later developped in Etruscan would have appeared predictably whenever stress accent wandered to the second syllable of this pre-Etruscan stage, inevitably leaving a doomed schwa in the first syllable to be eventually omitted. This is an alluring hypothesis particularly considering that there is an uncanny word match in both form and meaning in a language far far to the east of Etruria, in the depths of Anatolia: Hittite šalik- 'to approach'. Yet it doesn't end there. I already have a growing pile of what appear to be ancient Indo-European loanwords of Anatolian origin in Etruscan (eg. sal "great" = Hittite šalliš) so this latest connection would just add to my tidy folder of evidence. However, apparently the etymology of this Hittite verb also remains unknown to current linguists. As such, the alluring question for me then becomes: Did Pre-Etruscan truly borrow this term from an Anatolian language or does this Hittite term to the contrary reflect Aegean influence on Anatolian languages? Or, for that matter, have I simply overanalysed? Yoshida, The Hittite mediopassive endings in -ri (1990), p.65 (see link). Weeks, Hittite Vocabulary: An Anatolian Appendix to Buck's Dictionary of Selected Synonyms in the Principal Indo-European Languages (1985), p.137 (see pdf). More info on this can be found at the University of Toronto's Tell Ta'yinat Archaeological Project (TAP). Why has Antarctica been a historical "death zone" for human beings? It may seem like a stupid question at first but it's worth investigating exactly why, out of all the continents that humans have managed to occupy in prehistoric times, Antarctica sticks out like a sore thumb as the only strictly human-free zone. 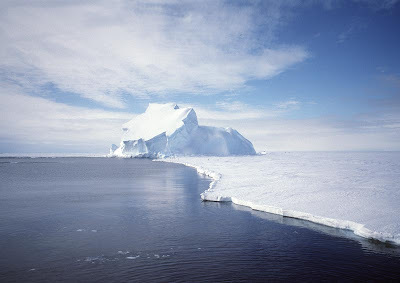 So far, there is absolutely no archaeological evidence of human habitation of Antarctica before the early 20th century. It's natural to simply presume that this is because of the extreme cold. Yet it's not the cold that's at the heart of the problem of living on this continent. Inuit peoples living at the opposite pole of the earth prove that surviving in a bitterly subzero environment of snow and ice is indeed possible and that it has been possible for numerous millennia. Siberian regions north of the Arctic Circle have apparently been occupied since up to 35,000 years before present. There's no want of food in Antarctica either, at least theoretically, since the ocean has always been a veritable seafood buffet for coastal cultures and if all else fails one might try taking a bite out of the penguin population. If Australian Aborigines are suspected of voyaging to Australia by boat as much as 60,000 years ago, it would almost appear that there was no barrier to stop humans from arriving to the Terra Incognita at all. We also know that the very tip of South America was occupied more than 11,000 years ago. So, it might stand to reason: If humans were present in southern Chile so very long ago, how could it not be possible for humans to spread to nearby Antarctica? Thanks to the internet and modern technology, we can peruse the relevant geographical data safely in the comfort of our own homes and understand why it would be next to impossible for a prehistoric band of people to survive the trek, let alone survive the destination. First, a flimsy handmade boat would be no match for the stormy seas and currents of the circumpolar ocean. A second consideration is the lack of terrestrial "stepping-stone islands" between even the nearest points of departure (eg. the tip of Chile) and the barren, glacial coasts of Antarctica. 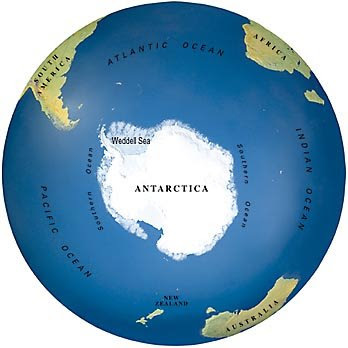 While South America and Antarctica may appear to be "nearby" on a standard map, they are seperated by miles and miles of open waters. Tonnes of water and nothing to drink. Thus we have a perfect recipe for an effective barrier against prehistoric human occupation on the coldest continent on Earth. Alexander/Fairbridge, Encyclopedia of Environmental Science (1999), p.21 (see link): "Unlike the Arctic, the Antarctic region has no indigenous population and no record of human habitation before the early 20th century." 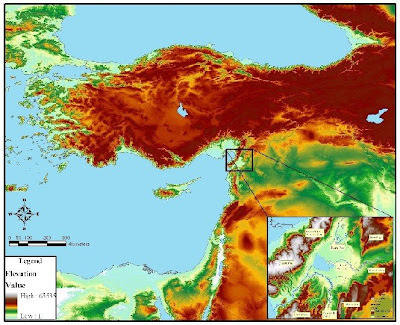 Hoffecker, A prehistory of the north (2005), p.81 (see link): "In fact, it is now apparent that Middle Pleniglacial settlement of the East European Plain and Siberia extended as far as the Arctic Circle (66° North) and beyond. "; Foley, Anthropological linguistics (1997), p.58 (see link): "'Modern' Homo sapiens appears throughout large areas of Eurasia. Indeed, the first colonization of Siberia dates from this period (35,000-30,000 years ago) (Klein 1985) and may have even extended into the Americas (Guidon and Delibrias 1986)." Schiffer, Anthropological perspectives on technology (2001), p.196 (see link): "A deep-sea trench isolated the Australasian continent and required that ancestors of the Australian Aborigines had to have practiced overwater voyaging out of sight of land in order to reach this new land, establish viable colonies there, and return to tell about it." Moreno/Gibbons, The geology of Chile (2007), p.327 (see link): "To conclude, the data point to the arrival of Homo sapiens at the southernmost tip of the Americas between 15 200 and 11 000 yr BP in the context of abrupt climate change at the Pleistocene-Holocene boundary, although there are controversial claims of even earlier human presence." Typically heard statements online like these are "A third of Germanic is from non-Indo-European substrate" or "More than 90% of the Tok Pisin pidgin is of English origin." I've found that people no matter how supposedly educated they are about language and linguistics, seldom ponder on whether these kinds of statements are factual or verifiable at all, and will often shut down their devil's advocate at the foot of a reference, fully satisfied that the statement must surely be well-researched for it to be published and therefore true. Effectively if things are worded impressively enough, a careless author with a PhD can, wittingly or not, will facts to be so as long as they never admit one's insidious error in reasoning and simply let the credentialist bias of the general public do the service of burying one's bone of shame in the backyard. Out of sight, out of mind, they say. The clear reason why these statements have absolutely no validity in logic is because the vocabulary of a natural language can never be quantified. Imagine how many words are in the English language, for a second. Do you think there are 10,000? 200,000? 4 million? 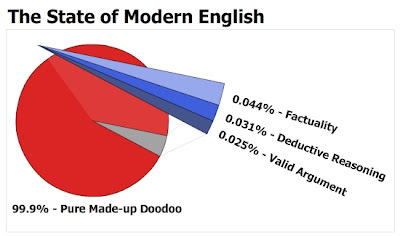 Exactly how many words does the English language have? How would we go about counting the words? Do we restrict ourselves to colloquial terms or expand to technical terms? Or even terms that have yet to be invented but have the potentiality of being used based on the grammar of the language (eg. intensificate or macrolinguisticology)? The solution is evidently intractable, not just because no sooner do we attempt to tally it that new words enter into the language, but also because even when a language is static and moribund (such as Latin for example), there's no way of counting all possible words in a language because the grammatical combinations and styles available to a speaker of any natural human language to form words are quite literally infinite in number. What then is 99.9% of infinity? Now it should be clear why any argument dependent on an unprovable percentage of vocabulary is silly and pointless, right? Yet, what should is often not what is. Alas, rather than accepting this inevitable conclusion, new words may be employed to merely obfuscate the issue. An author may ramble on about not just a percentage of "vocabulary" or "lexicon" but of something even more subjective like "core vocabulary". Consider for example Hubert Lehmann's article Towards a core vocabulary for a natural language system [pdf] wherein the author confesses on the one hand that "currently it does not seem possible to precisely define the notion of core vocabulary" while nonetheless attempting to prove the patently futile, as if one hemisphere of his brain wasn't aware of what the other half was plotting. Naturally the term core vocabulary is no more concretely definable than the simpler term vocabulary itself and therefore it's proof of nothing at all but a general human tendency to waste paper, ink and bandwidth. Corson, Using English Words (1995), p.200: "Haugen (1981) also notes the effect of 'the Anglo-American empire and its Latinised English' (p. 114) on Norwegian, where almost 90% of new words in the language come from English (Norstrom, 1992)." Baker/Jones, Encyclopaedia of bilingualism and bilingual education (1998), p.147: "English-based pidgins derive as much as 90 percent of their lexicon from English." Based on Phoenix's latest entry on pairs of suspiciously similar Proto-Indo-European (PIE) stems (see Phoenix's Blog: #6 *(s)kerp- ~ *gʰrebʰ-), I discovered what I admittedly expected to eventually uncover - that these pairs are in part the product of early Proto-Semitic (PSem) loans in the neolithic Mid IE period and in part the product of phonotactic constraints imposed on stems that irregularly lost their *s- in the Late IE period, perhaps due to PIE speakers losing track of the true etymological source of these stems in the course of time. I remember seeing a stem similar to *gʰrebʰ- somewhere in Proto-Semitic. As I've explained to Phoenix, I treat Nostratic works such as the sources of Allan Bomhard and John Kerns as helpful leads to potential IE-Semitic contact. Bare with me, since while I'm a kind of sympathist to the theory of Nostratic, I hardly believe that Bomhard and Kerns are completely on the ball with it and there are many series which they consider cognate but which I think are more likely more recent loans, particularly so when they list a supposed cognate series with only PIE and Proto-Semitic data to substantiate their reconstructions. Very suspicious indeed. So, it's not surprising that I managed to find a lead in one of Bomhard and Kern's books (see Bomhard/Kerns, The Nostratic Macrofamily (1994), p.386) which compares PIE *gʰrebʰ- "to scratch" with a list of Semitic data which suggest a triliteral skeleton *grb. It just so happens that precisely this skeleton is explicitly listed in Murtonen, Hebrew in Its West Semitic Setting (1989), p.140 with accompanying attested forms in various Semitic languages and with semantics revolving around "itching". PSem *garābu "to scratch" ~ *šagāribu "made to scratch; itchy"
MIE *ɢaréba- "to scratch (tr.)" ~ *saɢérba- "to scratch (intr.)" Theoretically, the stemfinal *bʰ would devoice to *p in original *skerbʰ- once speakers of Indo-European no longer were consciously aware of the historical connection with *gʰrebʰ-, and this would especially occur after *s- came to be irregularly omitted and phonotactic "stop voicing harmony" pressures took over. Once the sibilant disappeared, it would be all too easy for even a native speaker to get confused between a historical phonetic [k] (an allophone of voiced *gʰ following a sibilant) and the homophonous phoneme *k. The confusion would be made more likely if this "optional" s-mobile as a fossilized foreign morpheme, as I continue to maintain, had never ever become a productive phoneme in Pre-IE or PIE as some PIEists still believe. Let's make this clear and concise. Contrary to dismayingly popular belief, "good faith" is not a logical principle whatsoever. The tip-off is the two completely subjective words that this obnoxious term is composed of: "good" and "faith". First, what is "good"? We learn thoroughly from a proper knowledge of history and world issues that this question is silly because it can be different from culture to culture and period to period. It was okay to burn women accused of witchcraft once. Now, not so much. In Canada, we support the rights of women to vote and own property. In Afghanistan, not so much. No matter how conscientious and seemingly well-argued one's opinion of what is good, there will always be another who will oppose it with a differing point of view. So as practitioners of logic, it's pointless for us to dwell on what is "good" or "evil" since these are terms with more interpretations than there are people in the world, causing an unhealthy "infinite loop" in reasoning. Then there is the term "faith". I don't have faith. I never will. I don't intend to (re)start either. During my childhood, I was indoctrinated to believe by my well-meaning fundamentalist parents that the earth could only be 6000 years, no matter what the purportedly evil scientific evidence, and that evolution was an intentful academic conspiracy meant to undermine the faithful worship of God. I just had to have faith to suspend all logic just waiting to bubble up from my severly oppressed brain. Been there, done that, never ever again. Like the term "good", there are more belief systems than the stars in the sky. "Faith" should never be uttered in logical, objective discussion and yet far too often it is by not just the woefully uneducated but even by persons with university degrees! Now, if both "good" and "faith" are such irrational and meaningless terms, what then of the combined term "good faith" which is supposed to simply mean "compliance with standards of decency and honesty" (cf. Answers.com: good faith)... and which is in itself clearly another subjective term. The term usually ends up being redefined as a philosophy of belief that one should always **assume** that a person's intent is **good** unless **shown otherwise**. Three logical issues here involve idle assumption, the imposition of a subjective term "good", and the matter of when if ever it can be convincingly "shown otherwise" that a person's intent is "un-good". Rational-minded people will see the dilemma immediately in this nonsense since, if we cannot logically define what is "good", we will never be able to define what is "un-good" or "bad". Therefore, good faith is nothing more than a covert carte blanche for trolls to castrate all reasoning from mature communication and snuff out any flames of constructivity. As long as good faith is allowed to dictate, there are no limits to stupidity or maliciousness, both of which have the exact same deleterious effect anyways despite the common false dilemma. If a blogger or forum moderator is mature and sensible enough, (s)he will recognize that logical debate must be governed by nothing else than logic itself, not something as puerile as good faith, blind faith or any other senseless kind of faith. When done unslothfully, negative elements despite the cowardly anonymity of the speaker can be sussed out of a debating group immediately, even before the potentially harmful comments are posted, by the consistency of their dyslogical statements that regularly employ any number of the well-known logical fallacies long ago exposed. No more idée-fixes or beating dead horses with circular arguments because we can gauge the presence of logic by logical means. This "pruning" by the blogger or forum moderator is not to be done out of emotion, as is far too often done, but only by conscious logical assessment. While it may seem "mean" to bleeding hearts, the result is that not only will angry trolls be silenced, but also silly children who have little yet to offer a mature debate in their forgivable ignorance, and the hopelessly insane who can never be reasoned with no matter what incontrovertible fact is presented. Alas, the effectiveness of one's moderation is fully incumbent on one's comprehension of logic, something which is not intuitive for most. I believe that once we get active and take the extra effort to properly moderate the websites we go to the bother of creating and advertising in the first place, such websites will become a breath of fresh air in contrast to the immaturity of the surrounding internet where the one with the biggest mouth and smallest brain wins. I can only suspect that good faith has been so popularized as it has because of confused religious zealots who sincerely take great strides in believing that all people are somehow constructive and "good" despite all the facts otherwise, and the tragically lazy who can't be bothered to own up to their own online commitments at the expense of their readership. "The rule itself means that you are to... almost literally, take a lawn-mower to your brain. You are to assume that every edit by every user is done with the best interests of Wikipedia and 'truth' at heart. Each edit is to be assumed as though the editor is free from bias and that the edit is designed to advance the concept of learning and knowledge and all these fluffy flowery things that we SHOULD all value. This rule itself, however, shelters trolls and those who come with a point of view they wish to propagandize." "Since the High Court overruled the General Medical Council and reinstated Professor Sir Roy Meadow it has been 12 days and counting. Yet the implications have not yet been fully understood. You can get away with being wrong, the judgment seems to say, as long as you were wrong in good faith. You should not be disciplined by your professional body, even if that body deems that you have broken its rules." "In other words, would any solitary human worthy of the name be recreationally cruel to a sick or weak person when he stood to gain nothing?" "Internet trolls regularly tread on gouty toes. They trick vulnerable people with whom they have no quarrel; they upset those people; they humiliate them; they break their hearts; they mess with them. They do it for something Hume didn’t perfectly name: the lulz — the spiteful high." "The troll behaviors that are classic on the Internet are actually more readily and narrowly defined — deliberately inciting hatred repeatedly so as to disrupt and annoy. It’s an absence of good faith; it’s opposition-defiance disorder sort of behaviour constantly challenging the rules just for the sake of challenging them, not for the higher cause of establishing the truth, or advocating a sincerely-held point of view." Now, after proving how inanely subjective the term is and the problems that it condones or even causes, who in their right mind would still utter the phrase "good faith"? Quite frankly no one. Only mentally lazy individuals (aka "troll enablers") or bona fide trolls, neither of which are of much use to academic debate or society. Stay true, fellow logicians. PIE "look-alike stems" - Evidence of something or a red herring? On his blog, Phoenix has been dwelling on several suspicious stem look-alikes in Proto-Indo-European. While he's been attempting to work up a case for consonant gradation in PIE or Pre-PIE, I am far too skeptical to accept this Kortlandt-inspired view. In relation to this topic, Frederik Kortlandt has suggested that Proto-Uralic too had consonant gradation when in fact most Uralicists today accept that consonant gradation was a post-Uralic innovation, one of many flaws in his work that makes it difficult for me to take seriously. (Other important flaws in his theories being a flamboyant artistic license in his reconstruction of familiar words in both Uralic and IE). Yet what if there is actually something behind these pairs? For the sake of brainstorming, the third and fifth pairs in Phoenix's list appear to suggest a possible solution that might be enticing for future examination. In reconstructed Proto-Indo-European, just like in any living language, there appear to be phonotactic pressures which determined how sounds could validly fit within a word. One important curiosity whose origins I have yet to solve to my satisfaction is that there appears to be some sort of "voicing harmony" such that voiced stops (ie. voiced aspirated stops, traditionally speaking) can only appear in a verb root with other voiced stops while voiceless stops can only appear with other voiceless stops. Creaky stops (ie. traditional plain voiced stops), no doubt descendants of ejectives, could occur with both voiced and voiceless stops but not with other creaky stops. So *tep- or *ped- are valid root shapes yet **dʰep- or **deg- are not. Putting aside how this pattern arose in the first place, I wonder if this well-known phonotactic constraint in unison with the presence or absence of the so-called mobile *s-prefix could be to blame for these apparent pairs above. Here's how I imagine this could work. We start with a root like *dʰerbʰ- which has an *s-marked variant, *sterbʰ-. Following *s in an onset cluster, the voicing of a subsequent stop is neutralized as in English but otherwise the phonotactic constraint I mention above is unaffected. Now what if PIE speakers begin to drop the *s in *sterbʰ-? I'd imagine that, if the phonological constraint still holds, a resulting form *terbʰ- might be pressured into becoming *terp- to maintain the stop voicing harmony of yore. This then could especially help to explain the fourth stem pair in this list: *treup- ~ *dʰreubʰ- (via an *s-marked intermediate variant of *dʰreubʰ-, namely **streubʰ-). Denis Sinor, The Uralic languages: description, history, and foreign influences. Handbuch der Orientalistik, v.8 (1988), p.274: "Relating gradation to Uralic or even Finno-Ugric has been criticised because it is only a feature of the languages mentioned above and is not found in any other Uralic language. Scholars have therefore seen gradation in Balto-Finnic and Lapp as the result of parallel, but separate development to the gradation in Samoyed." (see link).